After blogging here for 3 years, I’ve now moved Scytherspace under the umbrella of my SteveTomlinCrafts website. 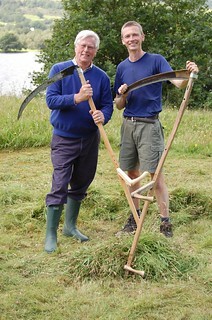 There you’ll find all the latest news and details of my Learn to Scythe courses. Click here to continue to the new scythe site. I did my first real mowing on a mountainside in the Pyrenees. Rising at dawn Peter and I would mow together while the grass was at it’s best and the day still young. From the first day it was addictive, a search for that elusive moment when everything comes together in the effortless swoop of blade cutting grass. Milking and breakfast followed with then the hot day’s efforts to turn the grass into hay. 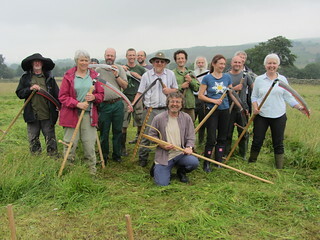 When I returned to England I had to wait 5 years until the first Somerset Scythe Festival to see someone else using one of these lightweight tools. I’ve been involved and just as addicted ever since. All that time I thought I was the only person in my area interested in scythes. Maybe you think you are too. This site is a place to celebrate all that is wonderful about the scythe; a beautiful, efficient tool and symbol of post peak-oil technology.